All Draped Bust Dollars were struck at the Philadelphia Mint and none have a mint mark and since they’re all rare then there value is determined mostly by their grade and variety status. The 1797 date, and this includes all known varieties, has a mintage of 7,776 and is the lowest mintage, and the 1799 date has a mintage of 423,515 but there’s not a lot of separation in value because they have a low survival rate. 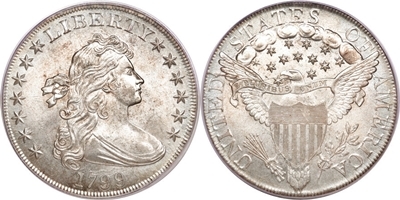 You can buy an AG3 (About Good) for around $1,000 and a 1799 in the same grade for just under $900 but this will depend on eye appeal for this grade and does not include problem coins. Problem coins always sell for a discount. Draped Bust Dollar value for any date and in the lowest condition is upward of $1,000, but if you can find a cleaned, damaged or holed coin then you can buy at a bargain but it’s still going to cost arounf $600. Hard to find a better deal even with damaged examples. If buying MS (Mint State) examples these will cost anywhere from $18,000 and to $75,000 each. I wouldn’t by any high grade examples for retail unless they’re graded by PCGS, NGC or ANACS. 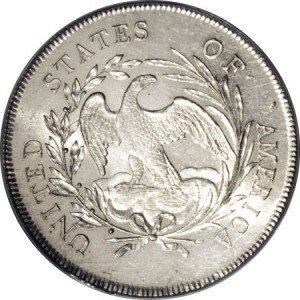 Here’s a list of varieties for Draped Bust Dollar and the 1795 through 1798 are the most valuable, but Draped Bust Dollar Value for the varieties doesn’t make much difference in the lower grades. However, when the grade get’s higher then there’s some separation between the values of the varieties. 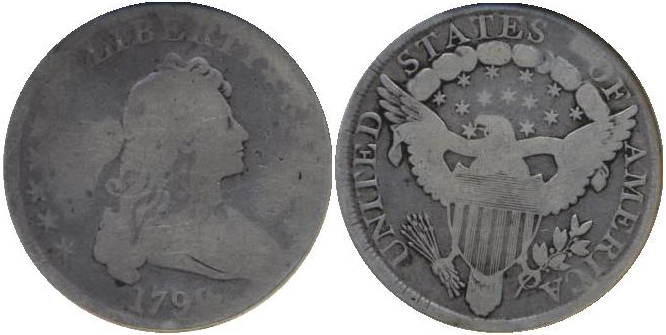 For example, the 1797 9×7 Stars, Obverse Stars, Small Letters is worth around $10,000 in VF35 but the 1795 Off Centered Bust is only worth $4,600 in VF35. 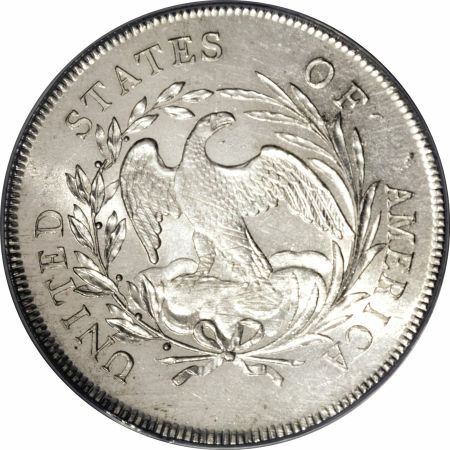 Draped Bust Dollar value is determined by the condition, grade of the coin, date and variety.